Author: James Floyd Fletcher; 1935; second printing 1982, with index added; 158 pages; out of print. Rev. 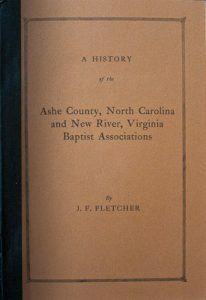 Fletcher, father of notable North Carolinians Arthur L. Fletcher and A.J.Fletcher, describes in detail the growth of Baptist churches in a region of the country where alliances developed across state boundaries northwest of the Blue Ridge Mountain barrier. In his words: “There has been joy in poring over old records, carefully kept in old chests and trunks in scores of mountain homes, and in searching through the membership of a dozen or more churches for a copy of a missing minutes of some year.” Written at Oak Hill Academy, which he served as pastor for many years. On Sale! Was $24.99, now only $6.99!